Matchbook Romance is an American rock band from Poughkeepsie, New York and was formed in 1997. were signed to Epitaph Records. They released two full length albums and one EP. 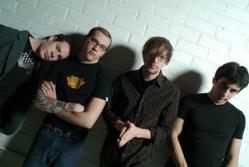 Their EP, West for Wishing, released in 2003 was their first recorded album during their time on Epitaph; their full-length debut album, Stories and Alibis, was recorded in the same year.